Download AMCAT OSI, TCP/IP layers and protocols Questions 2019 (AMCAT Computer Science): There are so many candidates who refrain from attempting Computer Science section in AMCAT considering it as non mandatory. But to emphasize, it is that module which attracts the attention of recruiters. So to grace the profile with good scores in Computer Science, always increases the chances of selection and immediate calls. All the big daddies of IT industry like Cognizant, Accenture, Infosys, Wipro, etc. count AMCAT score as a major standard and parameter for hiring. Hence below we bring you AMCAT OSI, TCP/IP layers and protocols Questions for practice in Computer Science. 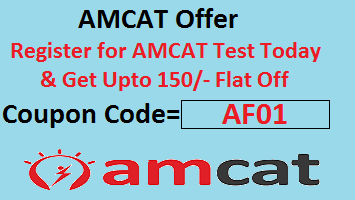 For the engineering candidates, especially of Computer Science branch, must take up AMCAT Computer Science module. It covers questions from basics of operating system and computer architecture, computer networks and database concepts. It consists of 26 questions to be completed in 25 minutes. From the topic OSI, TCP/IP layers and protocols, mostly 2 to 3 Questions come. The difficulty level ranges from average to tough. It can take about 1 to 1.5 minutes to solve the questions specific to this section. OSI (Open Systems Interconnection) model was designed by the International Organization for Standardization (ISO), It has seven layers. Each layer describes a different function of data travelling through a network. They are most commonly used by vendors. The layers are mostly numbered from the last one, i.e the Physical layer is consider to be the first layer. Application layer : This layer is the closest to the user. It enables network applications to communicate with other network applications. Presentation layer : It defines data formats. Compression and encryption are defined at this layer. Session layer : It defines how to establish and terminate a session between two systems. Transport layer : It performs segmentation of great chunks of data received from the upper layer protocols. Also, it establishes and terminates connections between two computers. Used for flow control and data recovery. Network layer : It works on device addressing, routing, and path determination. Device (logical) addressing is used to identify a host on a network (e.g. by its IP address). Data link layer : It encapsulates a packet in a frame. A frame contains a header and a trailer that enable devices to communicate. A header, most commonly, contains a source and a destination MAC address. A trailer contains the Frame Check Sequence field, which is used to detect transmission errors. Physical layer : It decides how to move bits from one device to another. Also, it works on how cables, connectors and network interface cards would interact and send and receive bits. The TCP/IP model was created in the 1970s by the Defense Advance Research Project Agency (DARPA). In a similar way like the OSI model, it describes general guidelines for designing and implementing computer protocols. It consists of four layers: Network Access, Internet, Transport, and Application. 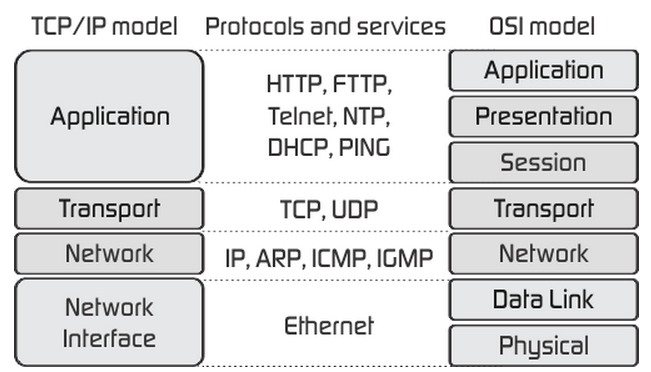 Ascan be noted, the TCP/IP model has fewer layers than the OSI model. The Application, Presentation, and Session layers of the OSI model are merged in only one layer, Application layer, in the TCP/IP model. Also, Physical and Data Link layers are called Network Access layer in the TCP/IP model. Question 1: Which of the following IP address class is Multicast? Question 2: How many layers are in the TCP/IP model? Question 3: Which layers of the OSI model are host-to-host layers? A. B. C. D.
Question 4: Repeater operates in which layer of the OSI model? Question 5: What is the address size of IPv6 ? Question 6: MAC Address is the example of? Please comment for any queries and updates on AMCAT OSI, TCP/IP layers and protocols Questions.